Care package received, and celebrated! I sent her some Halloween decorations and a pumpkin carving kit (most of them finds at my local Dollar Tree, or in the $1 bin at Target) so she can decorate her apartment, and maybe have some supplies to throw a little party. My favorite is the white and green sign that says “Witch Parking Only.” I love it because underneath the witch (you can’t see it in the photo) it says “All others will be toad.” That made me laugh… a lot. She got some little costume items too, some clip in orange extensions, some glow in the dark nail polish, etc. Everything a little witch needs to look fashionable. For pre-packaged food, I sent her some Jif to Go for those delicious western MD apples, some instant Gatorade powder, gluten free pasta, and gluten free brownie mix (I even found some Halloween/Fall sprinkles for the top!). Stretch didn’t know that Snyder’s makes gluten free pretzels, but they do, and they’re delicious. I also sent my little singing bird some N’ICE throat lozenges for the upcoming winter. Now, see that fabulous thermal tote from Thirty One? The cute one with the butterflies and the green K? I have one just like it and it’s the most amazing lunchbox ever. Inside that tote were little goodie bags filled with gluten-free candy. I found a great list of gluten free candies online right here. I also put together little “bouquets” of Dum-Dum pops, and Charms Blow Pops. I grabbed three or four “movie candy” boxes I caught on sale (sour patch kids, sugar babies, and junior mints) and added them. Finally I filled the CUTEST little pumpkin bucket with M&Ms (regular and peanut butter). Then I went crazy in the kitchen. Of course I sent her some marshmallow pops (hers have regular chocolate on white marshmallows), but I wanted to give her a few other treats as well. Caramel apples were just the ticket. I melted a 10-ounce bag of caramels and 1 T. of butter in the microwave. I put sticks into my COLD apples (unwaxed!) and then dipped and swirled them in the caramel. The coating was a bit runny, so to help things set up a little faster, and to add more taste, I rolled the apples in nuts, or crushed gluten-free pretzels before setting them on parchment paper to set up. After the caramel had hardened, I melted chocolate and dipped the top of the apples (after removing the sticks!). I set the apples back on the parchment, put the sticks back in, and honestly, the apples looked like chocolate cupcakes! She got one pretzel, one peanut, one pecan, and one almond. Stretch, if you’re reading, make sure you CUT the apples to eat them! I doubt you’ll be able to bite these extra big, crunchy, chewy apples. I made marshmallow popcorn balls. Forget that whole boiling sugar until scorching hot…these popcorn balls end up tasting like those beloved Rice Krispies treats. I popped a bag of kettle corn in the microwave, and emptied all the popped kernels into a bag. I emptied a bag of marshmallows, a tablespoon of vanilla, a healthy tablespoon of salt and half a stick of butter into the microwave. I heated it up (stirring at regular intervals) until melted. I had three bowls of “add ins” ready for the popcorn balls – dried cranberries, chocolate covered peanuts, and chocolate covered raisins. I let the marshmallow cool slightly before pouring it over the popcorn. Coating my hands lightly with coconut oil, I gently mixed the marshmallow popcorn mixture until it was all coated. I divided the popcorn into eight, and grabbing a handful of an add-in, I formed the balls so that each one had something delicious to complement the kettle corn and marshmallow. These treats end up being sweet and salty and absolutely addictive. Finally, I whipped up some gluten free popcorn snack mix. Popcorn, gluten free pretzels, dry roasted peanuts, chocolate covered raisins, dried cranberries, and whatever leftover chocolate covered peanuts I had left. I tossed all the ingredients together, added salt…and then put the mix into my FoodSaver bags. I set the vacuum to “gentle” and removed the air before sealing. That will keep the popcorn crunchy until she’s ready to eat it. As you can see in the photo, I also had a great time playing with my new toy – a personal Cricut machine! Mads and I made cards, and Halloween gift tags that we attached to everything. I even channeled my inner Poe and wrote cute little poems to add to some of the treats. Stretch called me today and I had the thrill of listening to her as she opened the box and exclaimed with delight over each new surprise. It made me so happy to hear her so happy! I asked her if she was going to share any of her loot… she remained noncommittal. So, a little research into gluten free candy, a little work whipping up some homemade gluten free goodies, and finding some major bargains at my local stores turned into the best Halloween care package ever, and I am winner Mom. Stretch, I’m glad you were surprised and happy… just don’t eat it all at once…and remember to brush your teeth before bed! Y’all know Stretch is away at college, which is great for her but not so great for us. The worst part is when she misses holidays. She was particularly sad to have missed Halloween at home, despite being too old for Trick or Treat. I took her to a local store, where they sell candy in bulk and she got treats that way, but it wasn’t the same. 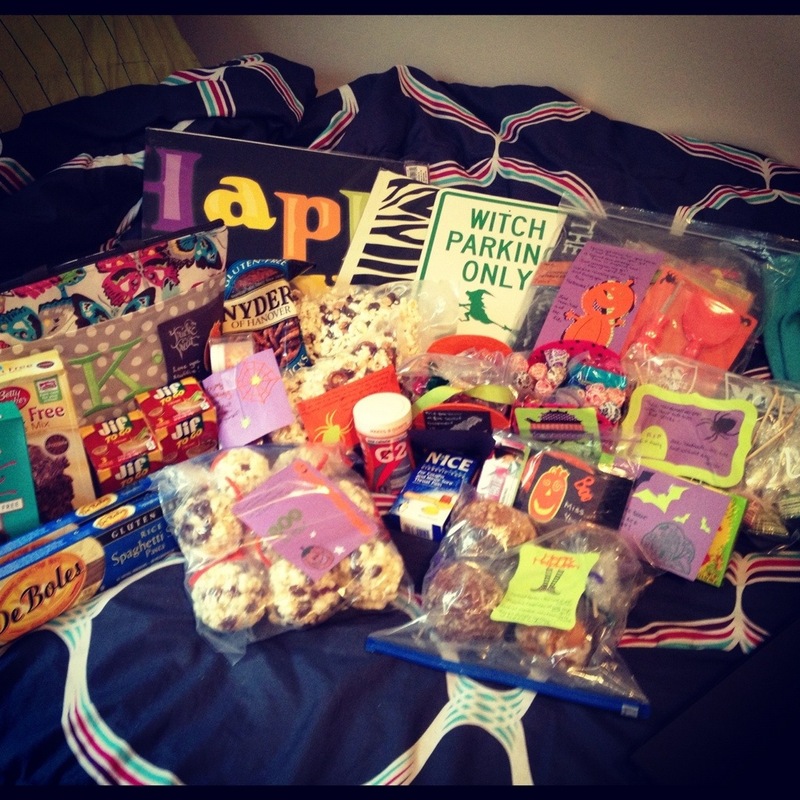 So THIS year, I have started picking up things for her that I will send up as a Halloween care package. So far I’ve found everything from decorations, to pumpkin carving kits, autumn scented candles, and nail polish. I’ve also picked up a few candies, however, the no wheat rule is proving more difficult than I anticipated. I had NO idea that gummy bears, and Sour Patch Kids have wheat in them! Malted milk balls, chocolate bars with crispy rice cereal, even some milk chocolates all contain gluten thanks to the barley used in malted milk… Wonka Nerds have gluten in them… as does the oh so delicious original Milky Way bar. What’s YOUR favorite Halloween candy? If it’s gluten-free it may find a place in Stretch’s care package. I’m always looking for inspiration. I will get started on packaging these goodies for her starting this weekend, and next week after my theater show is over I’ll whip up the homemade treats. I want to put it all in the mail to her by mid month so that she has time to use all the cute decorations and party supplies. And with that handy list I’ll be able to more easily determine what I can steal from the younger kids treat bags. Just don’t tell them I said so!